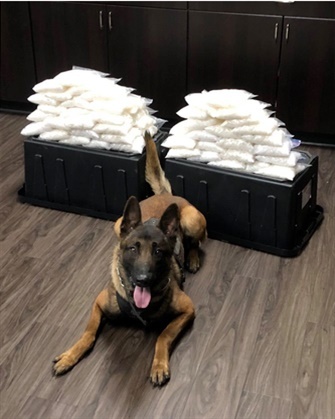 The West Covina (CA) Police Department's newest K-9 officer made his first bust over the weekend after he sniffed out sixty pounds of methamphetamine that was stuffed under the seats of a Nissan Rogue. Officers conducted a traffic stop on Saturday on a silver 2010 Nissan near Vincent Avenue and the 10 Freeway. When officers found meth under the driver's seat, they detained the driver and called in the K-9. Rye, West Covina's newest K-9 recruit, came to the scene where he sniffed out more meth that had been hidden inside two compartments. One was located under the driver's seat, with the other located under the passenger's seat, KFI reports.